Hello and welcome to our live coverage of stage 4 of the Vuelta a San Juan. Today's stage runs 185.8km from San José de Jáchal - Valle Fértil to Villa San Agustín. 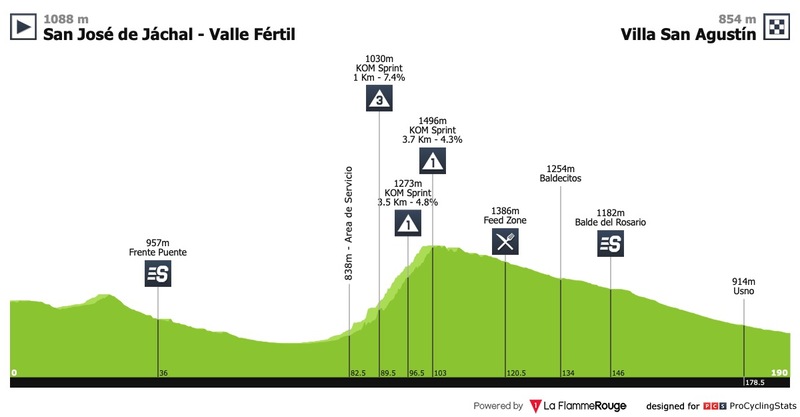 An early start for the race today (it's around 11am local time), and despite the big lump in the middle of the profile, it should be one for the sprinters. After yesterday's time trial, Deceuninck-Quick Step rider Iljo Keisse was ejected from the race by organisers after feigning a sexual act behind a waitress in a bar. Since then, team boss Patrick Lefevere has threatened to pull his team from the race over the expulsion. The team is, however, expected to start today's stage as normal. Click through for the full stories on Keisse's expulsion, and Lefevere's reaction. Deceuninck-Quick Step man and stage 1 winner Fernando Gaviria will be the favourite for victory today. A number of other strong sprinters are here too, including Gaviria's teammate Alvaro Hodeg, plus Sam Bennett, Peter Sagan (both Bora-Hansgrohe) and Mark Cavendish (Dimension Data). Italians Matteo Malucelli (Caja Rural-Seguros RCA) and Luca Pacioni (Neri Sottoli-Selle Italia) put in strong showings on stage 1 as well, taking second and fourth places. Today's stage officially starts at 11:05am local time, so 20 minutes away. The neutralised start should be coming up right about now, while tv coverage will get underway in ten minutes. UAE Team Emirates man and stage 1 winner Fernando Gaviria will be the favourite for victory today. A number of other strong sprinters are here too, including Alvaro Hodeg (Deceuninck-Quick Step), Sam Bennett, Peter Sagan (both Bora-Hansgrohe) and Mark Cavendish (Dimension Data). Live television coverage should be starting soon on Eurosport Player. Today's route has two intermediate sprints, coming 36km and 146km into the stage. Meanwhile, the three categorised climbs are clustered in the middle of the stage, coming as part of one long incline at 89.5km (third category), 96km and 104.5km (both first category). Quite a lot for whoever makes the break to fight over, then. Stage 4 is underway now. The peloton has left San José de Jáchal but we're still waiting for live pictures. Deceuninck-Quick Step have two wins in three days so far, both courtesty of Julian Alaphilippe, while youngster Remco Evenepoel took his first ever podium finish as a professional in yesterday's time trial. After the stage, both men spoke to Cyclingnews, telling us that the team's focus is on the general classification win for Alaphilippe. Read the full story here. In the meantime, you can check out our new Cyclingnews Women's Edition Podcast. The first episode is available today, and features interviews with CCC-Liv rider Ashley Moolman-Pasio and Trek-Segafredo DS Ina Yoko Teutenberg. The first action of the day comes from Daniel Zamora (Agrupacion Virgen De Fatima), who tries to break away from the peloton. He is quickly shut down, however. Here's a look at the finish of today's stage. It's all flat, with two turns in the final kilometre. It shouldn't pose too much trouble for the sprinters. Still no live pictures, but there is a breakaway up the road now. Zamora is back out there, and his countryman Facundo Cattapan (Municipalidad de Rawson Somos Todos) has joined him. The other riders in the break are Royner Navarro (Peru), Cesar Paredes (Medellin), Ricardo Paredes (Chile) and Robert Mendez (Uruguay). The group has an advantage of just over four minutes. The first intermediate sprint of the day is coming up soon, to be contested by the six men in the break. Finally we have some live pictures. Asociacion Civil Mardan are working on the front of the peloton having missed out on the break. Julien Vermote (Dimension Data) and Petr Vakoc (Deceuninck-Quick Step) are up there too. The break has passed the first intermediate sprint of the day, with Cattapan taking it ahead of Zamora and Ricardo Paredes. The entire Asociacion Civil Mardan team is up there at the head of the strung-out peloton. Four minutes is a big gap to bring back, though. The first on-screen time check shows a gap to the peloton is now 8:45, so the Argentine team's efforts will be in vain. Vermote and Vakoc are still there, rotating back and forth with the men in orange. Vakoc is riding for race leader Julian Alaphilippe, as well as Deceuninck-Quick Step sprinter Alvaro Hodeg, while Vermote is working on behalf of Dimension Data sprinter Mark Cavendish. We're around 45km from the first of the day's climbs. It's just a long, straight valley road until then. The riders are currently passing through Ischigualasto Provincial Park, a UNESCO World Heritage Site known for its rock formations and fossil beds. 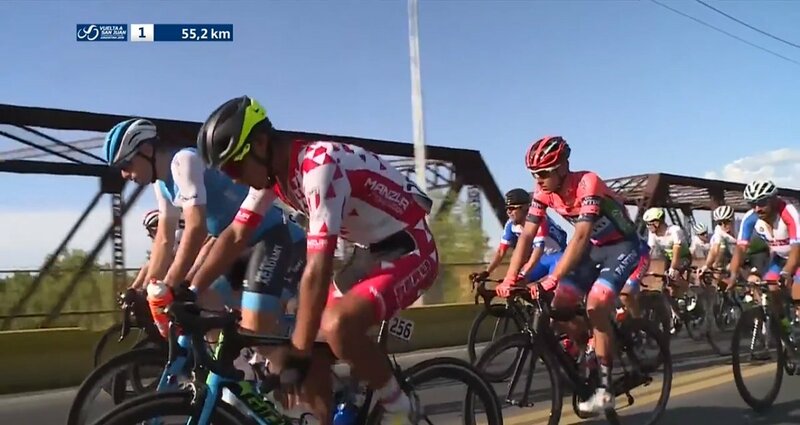 Some interesting kits in the break today, from the orange of Municipalidad de Rawson Somos Todos to the bright red and yellow of Agrupacion Virgen De Fatima and the ill-advised all-white getup of the Uruguay national team. Laureano Rosas (Asociacion Civil Mardan) shows off a tattoo on his bicep for the camera. It's unclear what exactly it was. The ex-Argentine national time trial champion took ninth place in yesterday's time trial. He lies eighth overall today, the best-placed native rider. He has won this race three times in the past (2014-16) and finished sixth here in 2017. Fernando Gaviria is having a chat with his ex-leadout man Maximiliano Richeze in the peloton. Not much going on at the moment as we await the first climb of the day. The gap is down to 6:10 now, with 76km gone. Here's a reminder of the mountain classification standings as we near the first climb of the day. 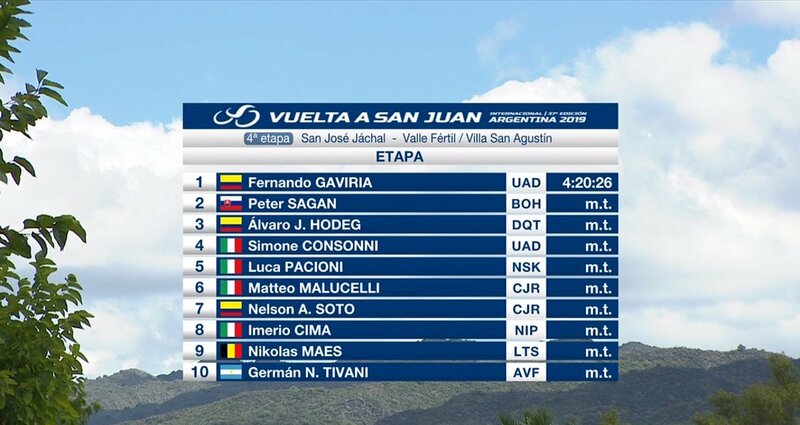 Miguel Alvarez (Mexico) leads with 9 points, followed by Daniel Zamora (Agrupacion Virgen De Fatima) on 7 and Hamish Schreurs (Israel Cycling Academy) on 5 points. Zamora is in the break today and should be looking to take the jersey. We're around 10km from the first climb of the day, a third category hill. The gap from the break to the peloton is now down to 5:15. There has been a crash in the peloton. It looks like two Lotto-Soudal riders were involved, as well as a rider from Neri Sottoli. Zamora took the maximum three points after outsprinting Cesar Paredes at the first climb of the day. Cattapan took third for one point. Zamora is the new leader of the mountain classification. Zamora leads over the second climb of the day, too. It's a first category climb, which gives him ten more points. Cesar Paredes pushed him all way but had to settle for second. It looks like Cattapan was third once again. Zamora and Cesar Paredes are alone out front now, with 6km remaining until the third and final climb of the day. Navarro was third over the climb, actually. Mendez took fourth. Navarro is with the two leaders now. So Zamora leads the classification with 17 points, while Cesar Paredes has 10 points in total. Current jersey wearer Miguel Alvarez remains on 9 points. This is the Peruvian national team's debut at the Vuelta a San Juan and they have a very pleasing kit - red and white with mini triangles dotted over the jersey. Their man Royner Navarro is one of the three riders remaining in the breakaway. Here's a shot of their rider Cesar Garate from stage 2. Tiesj Benoot has some blood on his arm. He must've been one of the Lotto riders to hit the deck earlier. Zamora took maximum points on the final climb of the day too. He has 27 in total now, and will wear the orange jersey tomorrow. Paredes (who has 18 points) and Navarro followed him over the line. It's a downhill run all the way to the finish now. UAE Team Emirates have sent Tom Bohli to the front of the peloton now, while Bora-Hansgrohe also have some representation. We haven't had a time check in a while, but it's safe to say that it's not five minutes anymore as a number of WorldTour teams work at the head of the peloton. It's a cooler 32°C today, according to Matt Stephens on Eurosport. That's a nice change from the previous stages, where temperatures were 8-10°C higher. There has been a crash at the rear of the peloton. A Peruvian rider has hit the deck, as has Matteo Furlan from Italian Continental team Team Beltrami Tsa – Hopplà – Petroli Firenze. Bora, UAE, Quick Step and Asociacion Civil Mardan are working at the front of the peloton, with the Argentine team well-represented at the front all day long so far. We're around 15km from the final intermediate sprint of the day now. The gap is down to 1:25. The riders are on a long, straight stretch of road and the peloton almost have the break in their sights. The break are close to the final intermediate sprint now. No bonus seconds for anybody in the peloton. Navarro leads over the final intermediate sprint, beating Paredes and Zamora. They're quickly back together, working to hold off the peloton. Meanwhile, the peloton have eased off the pace a bit, letting the gap go back up to almost two minutes. They didn't want to make the catch too early, it seems. Correction: With a bike throw at the line, Zamora snuck ahead of Paredes at the intermediate sprint. Under 40km to go now and the break are still fighting on. The gap is still up around the two-minute mark. Pawel Poljanski (Bora-Hansgrohe) is at the front of the peloton. 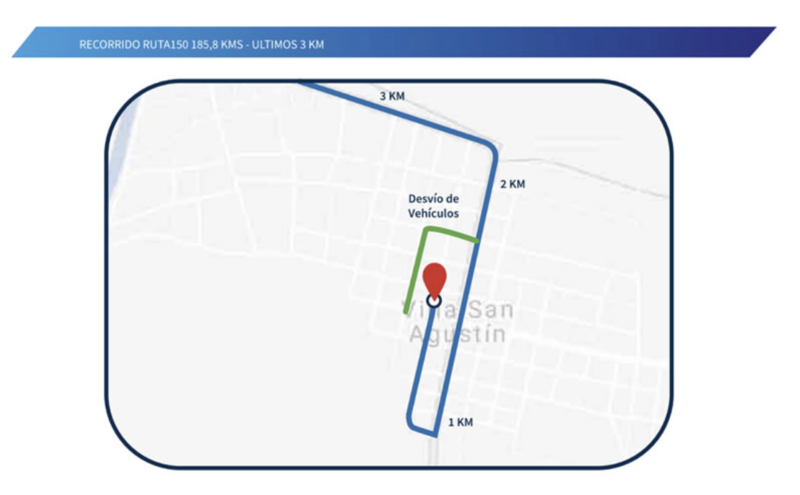 30km to go now, and the situation remains largely the same on these long, straight roads on the way to the finish in Villa San Agustín. The physical gap between the peloton and break doesn't look much different, but the peloton look to be be upping the pace now as we edge closer to the finish. The gap is actually down to just over a minute. The same teams are still represented at the head of the peloton - Quick Step, Bora and Asociacion Civil Mardan. Into the final 20km now and the gap is down to just 40 seconds. Inside the final 20km and the gap is under 40 seconds now. Back up to 1:10 of an advantage for the break. This could be closer than we thought. Royner Navarro drops back from the break. Very unfortunate for him and his breakmates as it looks like a puncture. Meanwhile, the Brazilian national team have taken up the pacemaking at the head of the peloton. The break passes through a stream running across the road, which looks like it could get a bit hairy for the peloton. They're 1:15 up the road. ...And the peloton manage to pass through without any problems. They did have to slow down quite considerably though. It's mostly South American teams at the front of the peloton right now. A curious absence of WorldTour teams as we head into the final kilometres of the race. Navarro is brought back to the peloton after his puncture. UAE Team Emirates have sent a man up front. The loss of Navarro from the break might make all the difference from the two men up front here. It looks like it'll be a close-run thing, and having an extra pair of legs working against the peloton might've made all the difference. The gap is under 40 seconds with 6km to go. The peloton will have the break in their sights on this long, straight road. Surely an added bonus as they chase down the duo. Brazil and Asociacion Civil Mardan are still on the front of the peloton, with Deceuninck-Quick Step up there too. Israel Cycling Academy and Dimension Data are also moving to the front. Israel Cycling Academy will be riding for Rudy Barbier or Riccardo Minali today. UAE and Lotto are there too. It's almost over for the break at this point. The break has been caught. So close yet so far for the duo. Into the final kilometre and now just two right-handers before the final straight. Alaphilippe is leading the peloton, working in the leader's jersey for Alvaro Hodeg. Richeze is leading out Hodeg. Consonni launches for Gaviria! Gaviria fights off Sagan for the win! The Slovak was on the wrong side of Gaviria and looked to have the momentum to get past, but just missed out at the line. Gaviria beat Sagan, while Hodeg took third. It's Gaviria's second win of the race, second of the season and second for his new team, UAE Team Emirates. We're waiting for the updated general classification, but Gaviria won't have taken the race lead back from Julian Alaphilippe. 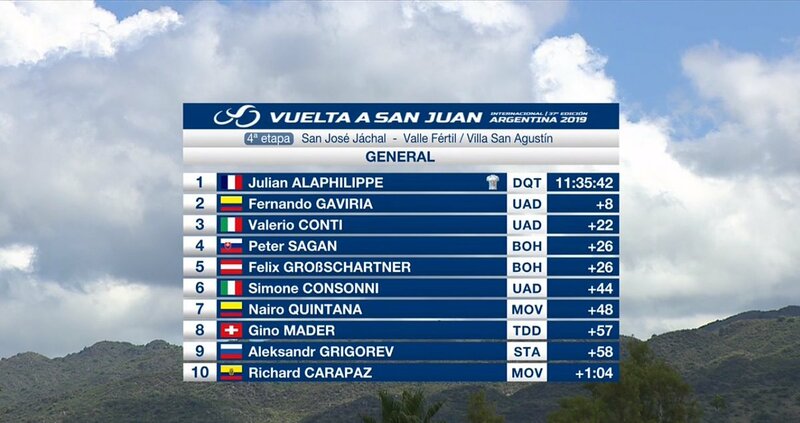 And here's the updated GC after today's stage. Alaphilippe retains the race lead, 8 seconds ahead of Gaviria, while Conti lies in third at 22 seconds. It's a rest day tomorrow, but the climbers will be coming out to play on Friday. The summit finish of the Alto Colorado lies in wait. Julian Alaphilippe, Valerio Conti, Felix Großschartner, Nairo Quintana and Richard Carapaz will all be up there, battling for the overall victory, so be sure to join us then. That's all from us today, so we'll see you on Friday.